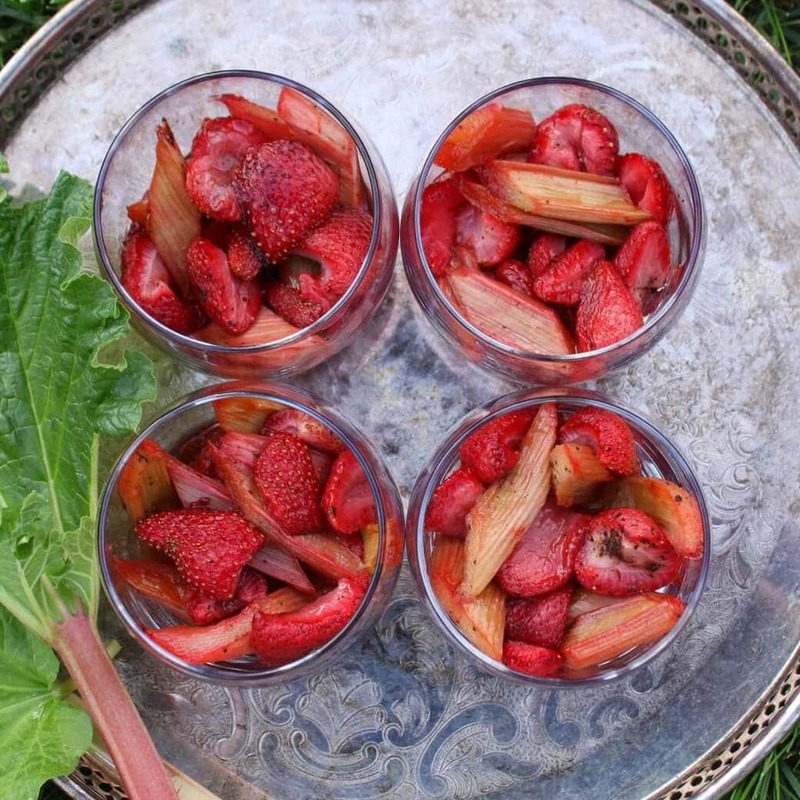 This Vanilla Roasted Strawberry Rhubarb is the perfect way to harness the flavours of spring! Top this sweet and sour treat with ice cream, custard, whipped cream or zabaglione. Here in Calgary the first signs of Spring have started to appear. After a long winter of below average temperatures, the snow is melting and I’m drying laundry on the deck! The squirrels are driving my dog crazy and I saw my first robins of 2019. For the gardeners out there, you know what comes next. Rhubarb! Rhubarb is one of the most hardy plants that grows in my yard. Year after year it’s the first to shoot up out of the cold ground. It doesn’t seem to require any special soil type or require hours of sunlight. In our yard, the rhubarb plant is stuffed into a small patch of dirt underneath our gas meter. I’ve never supplemented the soil with anything and it doesn’t get regular watering. Other than dividing it every few years, I leave it alone and it still grows like crazy. What is Rhubarb and Is It Safe To Eat? 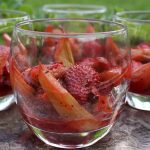 Rhubarb is a stalky herbaceous perennial that grows similar to celery. It comes in both red and green varieties and both are safe to eat. Rhubarb stalks are safe to eat but the leaves contain oxalate which can be toxic in large quantities. Use the stalks when they are relatively young (less than 10-15 inches long) because larger ones tend to become tough. Rhubarb is a vegetable that is very high in fiber and low in calories. This combination makes it great for weight loss, unless you dunk the stalks in sugar like I do! 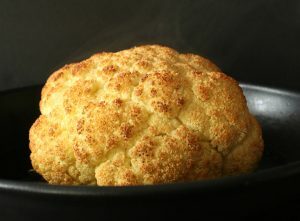 This tart vegetable is also high in anti-oxidants, calcium, Vitamin K, Vitamin C, iron, and Manganese. 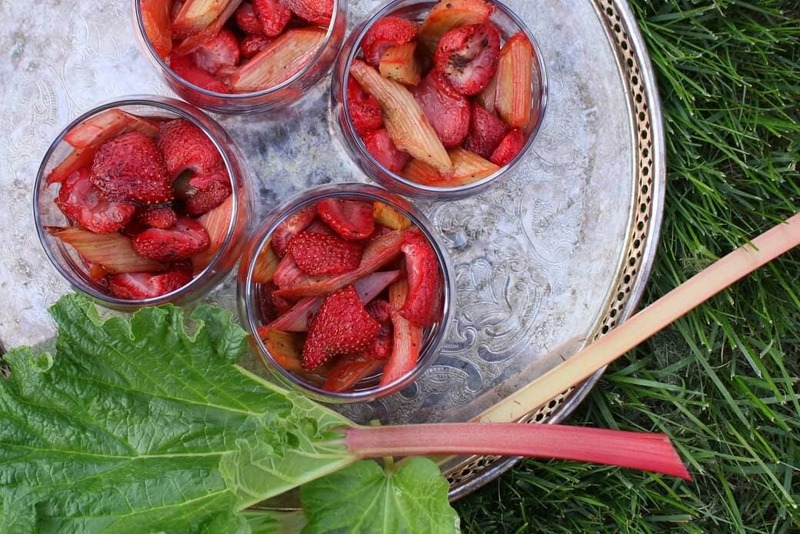 Strawberry Rhubarb has to be one of the most classic Spring time flavours there is. 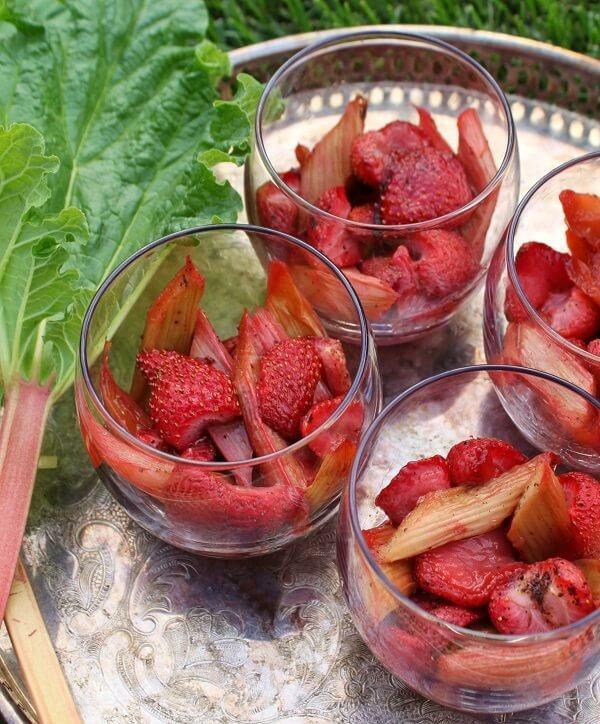 Rhubarb tastes like a sour green apple and the strawberries are so sweet! 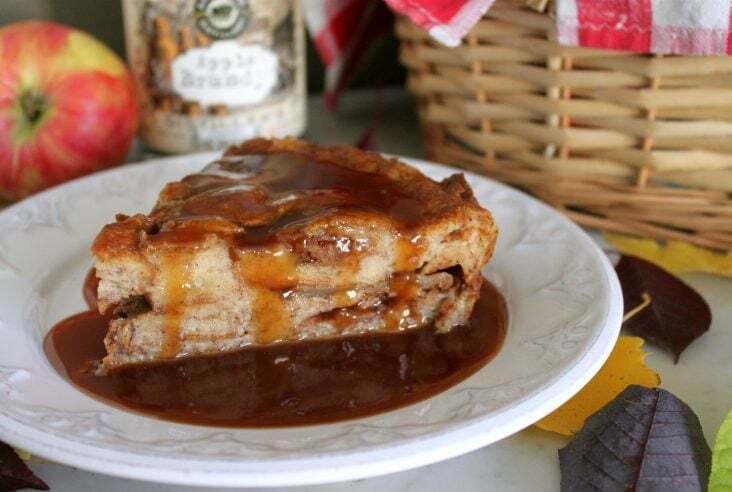 The tartness grabs your tongue and doesn’t let go until you follow it with a bit of sweetness. Enter strawberries…and sugar. 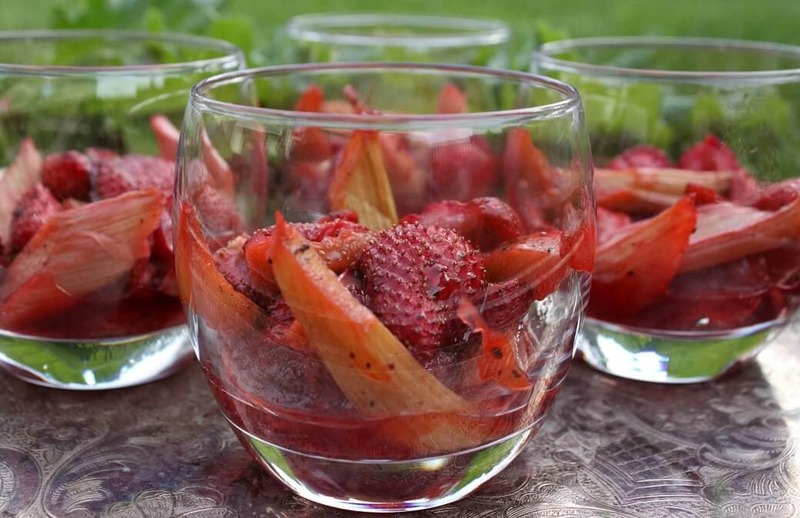 Vanilla Roasted Strawberries and Rhubarb are the perfect way to harness the flavours of spring! Top this sweet and sour treat with ice cream, custard, whipped cream or zabaglione. Toss cut fruit with sugar and ground vanilla in a large bowl. Bake at 350 F for about 30 minutes. Let cool. Drain juices into a measuring cup to use later. 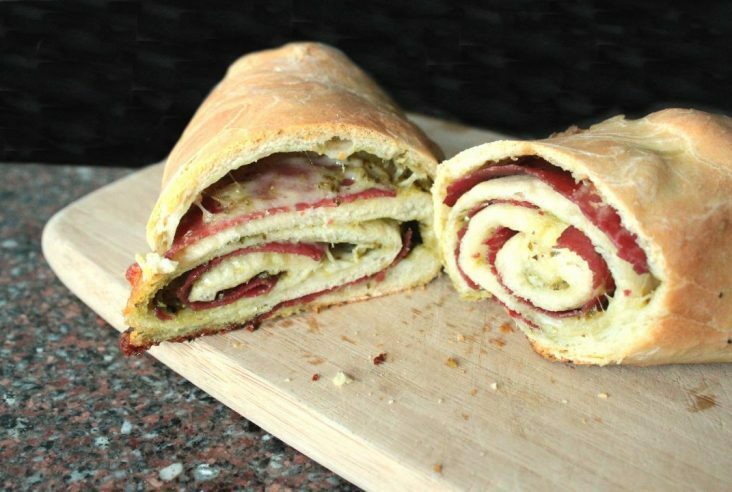 Serve with ice cream, whipped cream, custard, or zabaglione.